If one telescope can't get the job done, try using eight. Within the next 12 months, astrophysicists believe they’ll be able to do something that’s never been done before, and it could have far-reaching implications for our understanding of the universe. A black hole is a point in space with a gravitational pull so strong that not even light can escape from it. Albert Einstein predicted the existence of black holes in his theory of general relativity, but even he wasn’t convinced that they actually existed. And thus far, no one has been able to produce concrete evidence that they do. The Event Horizon Telescope (EHT) could change that. The EHT isn’t so much one telescope as it is a network of telescopes around the globe. By working in harmony, these devices can provide all of the components necessary to capture an image of a black hole. “First, you need ultra-high magnification — the equivalent of being able to count the dimples on a golf ball in Los Angeles when you are sitting in New York,” EHT Director Sheperd Doeleman told Futurism. Next, said Doeleman, you need a way to see through the gas in the Milky Way and the hot gas surrounding the black hole itself. That requires a telescope as big as the Earth, which is where the EHT comes into play. The EHT team created a “virtual Earth-sized telescope,” said Doeleman, using a network of individual radio dishes scattered across the planet. They synchronized the dishes so that they could be programmed to observe the same point in space at the exact same time and record the radio waves they detected onto hard disks. The idea was that, by combining this data at a later date, the EHT team could produce an image comparable to one that could have been created using a single Earth-sized telescope. In April 2017, the EHT team put their telescope to the test for the first time. Over the course of five nights, eight dishes across the globe set their sights on Sagittarius A* (Sgr A*), a point in the center of the Milky Way that researchers believe is the location of a supermassive black hole. 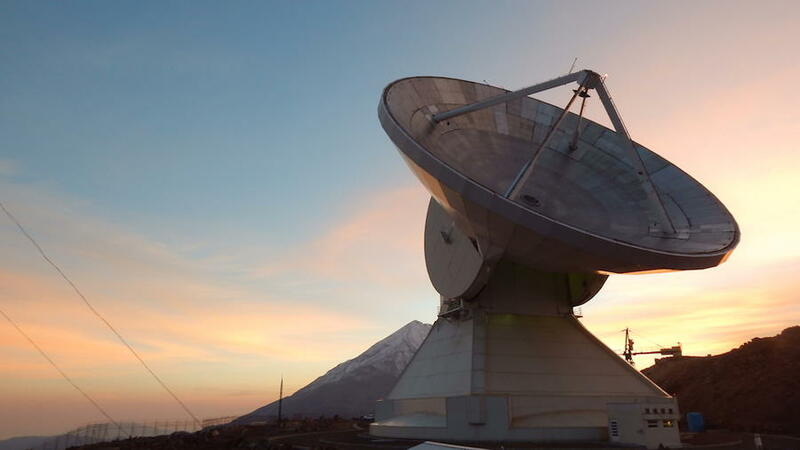 Data from the South Pole Telescope didn’t reach the MIT Haystack Observatory until mid-December due to a lack of cargo flights out of the region. Now that the team has the data from all eight radio dishes, they can begin their analysis in the hopes of producing the first image of a black hole. Not only would an image of a black hole prove that they do exist, it would also reveal brand new insights into our universe. In the future, researchers could take images of a single black hole over time. This would allow the scientists to determine whether or not Einstein’s theory of general relativity holds true at the black hole boundary, as well as study how black holes grow and absorb matter, said Doeleman. Still, the April observations of Sgr A* are just the first using the EHT, and Doeleman is keeping expectations in check. “Of course, we have no guarantee of what we’ll see, and nature could throw us a curve ball. However, the EHT is now up and running, so over the next several years, we will work towards making an image to see what a black hole really looks like,” he told Futurism. While the entire team is excited about the prospect of producing that never-before-seen image, they are also making sure to work carefully and deliberately on the data, said Doeleman, and have, therefore, not set a date for when results will be ready. Still, we’re closer than ever before to finally capturing an image of a black hole, and there’s no harm in hoping the EHT team crosses the finish line in 2018.